Magnificent Rectory offering exceptional character accommodation set in landscaped gardens. As sole selling agents we are delighted to offer for sale this superbly maintained and improved character home set in private landscaped gardens and enjoying an elevated position with views across the Bristol Channel. The property was built in the late 1800's and retains a comprehensive range of high quality original features including cornice ceilings, feature fireplaces and ornate door surrounds. 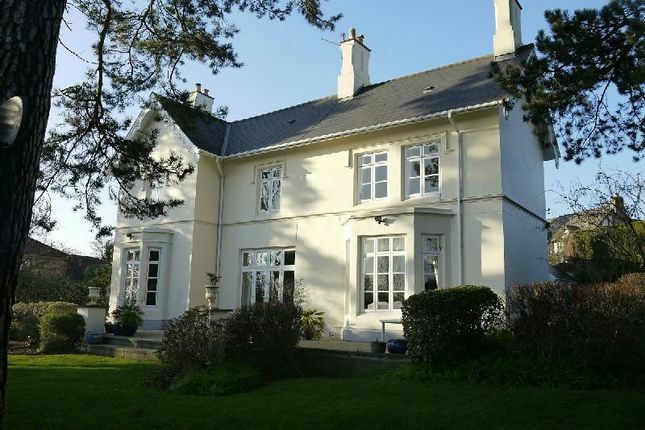 The Old Rectory is ideally located within easy reach of good quality local schooling, world class leisure facilities at the Celtic Manor Resort and road communications at Junction 24 giving easy access to Bristol, Newport and Cardiff. The property is approached by a shared access to a good size private court yard providing excellent parking and access to the recently constructed garage with electric up and over door. To the side and front of the property are well maintained gardens with large paved patio, areas laid to lawn, borders stocked with shrubs and trees with hedged and walled boundaries. The spacious ground floor accommodation extends to entrance lobby, cloakroom, utility/boot room, double doors to magnificent reception hallway with staircase to galleried landing and access to cellar, dining room with bay window over looking gardens and inner hallway giving access to family sitting room, library area, drawing room, study and bespoke hand painted fitted kitchen with granite work surfaces opening to large breakfast room with internal access to garage. At first floor level there is a light and airy galleried landing, master bedroom with spacious en suite bathroom, three further double bedrooms and luxury family bathroom. Ceramic tiled floor, built-in shelves, walls tiled to dado height, low level wc, pedestal wash hand basin, opaque window, coved and textured ceiling, Manrose ventilation fan. Ceramic tiled floor, Belfast sink, plumbing for washing machine, window, central heating radiator, glazed door to side pathway and garden. A magnificent reception hall with double entrance doors, two large double glazed windows, oak flooring, superb hardwood staircase to galleried landing, door and staircase to cellar, cornice ceiling, superb ornate detailing and feature door surround with glazed fan to dining room. Double glazed bay window to front, feature fireplace with marble inset and hearth and Living Flame gas fire, coved ceiling, central heating radiator. Television aerial point, oak flooring, impressive period fireplace with tiled hearth and free standing gas fire, central heating radiator, coved and textured ceiling with central rose, large double glazed windows with central French doors and over head windows over looking gardens. Central heating radiator, window to side, staircase with hardwood balustrade to study. Period fireplace with central log burner and slate heart, two central heating radiators, large bay window over looking gardens, television aerial point. Two windows over looking court yard, central heating radiator, telephone point. Large built-in storage cupboards, ceramic tiled floor, two double glazed windows over looking side garden, double glazed window over looking court yard, double glazed and leaded entrance door, two central heating radiators, door to garden, internal door to garage. Recently constructed with electric up and over door, two double glazed roof windows, Ideal Concord gas boiler providing hot water and central heating, double glazed window to rear, central heating controls. Spacious and light area with three windows, feature corniced ceiling and central ceiling rose, two central heating radiators, access to roof space, shelved airing cupboard. Two large windows over looking garden and enjoying far reaching views over the Bristol Channel, telephone point, central heating radiator, fitted wardrobes along one wall, coved ceiling. Separate large tiled shower cubicle, corner bath, low level wc, wall mounted wash hand basin with mono block mixer tap, two windows to side, ventilation fan, ceramic tiled floor, walls tiled to dado height. Central heating radiator, window enjoying views, comprehensive range of fitted wardrobes, overhead cupboard and central drawer unit. Central heating radiator, window, vanity sink unit with tiled surround, dado rail, coved ceiling with central rose. Central heating radiator, coved ceiling, fitted wardrobes and over head cupboards, window to rear enjoying views. Panelled bath, pedestal wash hand basin, bidet, low level wc, separate tiled shower cubicle, wired for wall lights, walls tiled to dado rail, opaque window to side, coved ceiling. The property is approached off Old Roman Road via a shared pavioured driveway giving access to the private court yard providing excellent off road parking and access to the attached garage with electrically up and over door. The side and front gardens are surrounded by a selection of mature trees with borders stocked with shrubs, large paved sun terrace with private aspect. All main services are available to the property.